Trendy chicken chili is becoming more and more popular. You'll find this to be even easier to make than the tomato based beef chili. 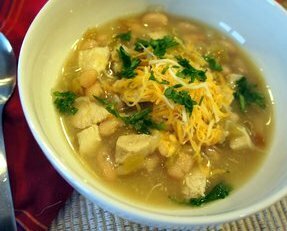 Made with chunks of chicken and two varieties of beans in a light broth, it is sure to be a favorite of both kids and adults. Follow these easy step-by-step instructions on how to make beef stew with your slow cooker. You will love coming home to this hot hearty meal. Learn to make homemade pasta to use for making machine or hand cut noodles to add to any type of soup.